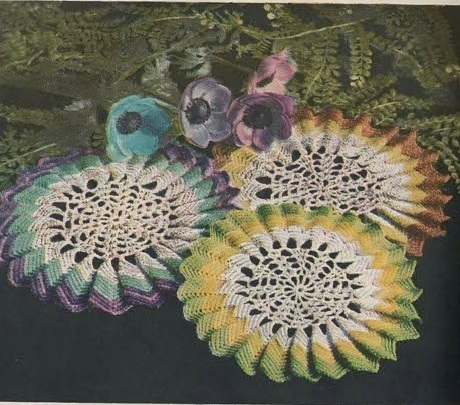 A LOVELY trio of colorful doilies, use these colors or your own favorite shades. To make a doily approximately 7 1/2 inches in diameter you will need one ball each of American Thread Company “Puritan” Mercerized Crochet Cotton in white, turquoise, shaded purples or colors of your choice, and a steel crochet hook number 7. With white, ch 6, join with sl st to form ring. Rnd 1: Ch 7, tr in ring, “ ch 3 tr in ring, repeat from " 9 times, ch 3, join with sl st in 4th st of ch. Rnd 2: Sl st into lp, ch 3, (dc, ch 3, 2 dc) in same lp, ch 2, dc in next lp, ch 2, * (2 dc, ch 3, 2 dc) in next lp for a shell, ch 2, dc in next lp, ch 2, repeat from * around, sl st in third st of first ch. Rnd 3: Sl st into lp of shell, (ch 3, dc, ch 3, 2 dc) in same lp, ch 3, sk the next lp, (dc, ch 1, dc) in next dc, ch 3, * shell next shell, ch 3, sk next lp, (dc, ch 1, dc) in next dc, ch 3, repeat from * around, sl st in third of first ch. Rnd 4: Sl st into lp of shell, ch 3, (dc, ch 3, 2 dc) in same lp, ch 4, sk next lp, dc in next dc, ch l, dc in ch 1 lp, ch 1, dc in next dc, ch 4, * shell in next shell, ch 4, sk next lp, dc in next dc, ch 1, dc in ch 1 lp, ch 1, dc in next dc, ch 4, repeat from * around, sl st in third st of ﬁrst ch. Rnd 5: Sl st into lp of shell, ch 3, (dc, ch 3, 2 dc) in same Ip, * ch 4, sk the next lp, (dc in next dc, ch 1, dc in next ch l lp) twice, ch 1, dc in next dc, ch 4, shell in next shell, repeat from * around, ending to correspond. Sl st in third st of first ch. Rnd 6: Sl st into center of lp of shell, * ch 12, sc in next lp, * ch 12, sk next 2 dc, sc in next dc, ch 12, sk next 2 dc, sc in next lp, ch 12, sc in lp of next shell, repeat from * around, ending to correspond Sl third st in of first ch. Rnd 7: * Ch 1 and work 17 sc over ch lp, repeat fro * around. Sl st in ch 1. Rd 8 Ch 1, working in back lp of sts throughout, work 1 sc in each of the next 7 sc, 3 sc in next sc, 1 sc in each of the next 7 sc, * sk next 2 sc, 1 sc in each of next 7 sc, 3 sc in next sc, 1 sc in each of next 7 sc, repeat from * around, sl st in ch 1. Repeat the last rnd for the remainder of doily working 2 more rnds in white, 4 rnds in turquoise and 4 rnds in shaded purples. Starch lightly. Pin in shape and press dry through a cloth.